The flood waters have risen to unprecedented levels. This century has witnessed environmental destruction on an unprecedented scale. Such an event was unprecedented in the 20th century. Unemployment has reached an unprecedented level. Crime has risen on an unprecedented scale. Did he have to be hospitalized? She needs to be hospitalized immediately. His wife’s been hospitalized for depression. 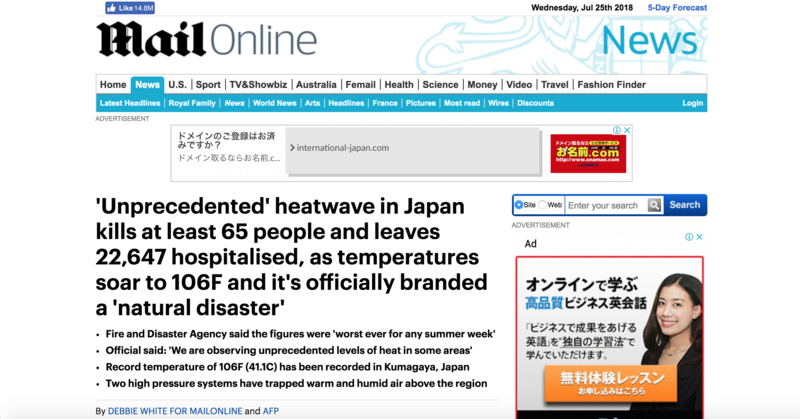 Japan‘s ‘unprecedented’ heatwave has killed at least 65 people in one week, with the weather agency now classifying the record-breaking weather as a ‘natural disaster’. In the week to Sunday, at least 65 people died of heat stroke while 22,647 people were hospitalised, the Fire and Disaster Management Agency said in a statement. Both figures are ‘the worst ever for any week during summer’ since the agency began recording fatalities resulting from heat stroke in July 2008, a spokesman said. As well as the 13 fatalities, 17 people were injured. There are thousands of traffic fatalities (= deaths in traffic accidents) every year. The first fatalities of the war were civilians. ‘We are observing unprecedented levels of heat in some areas,’ weather agency official Motoaki Takekawa said late Monday. The heatwave ‘is fatal, and we recognise it as a natural disaster,’ he told reporters. Eighty people in total have died from the heat since the beginning of July, and over 35,000 have been hospitalised. Many of the victims have been elderly people who were not using air conditioning. Among those killed was a six-year-old school boy who lost consciousness while returning from a field trip. 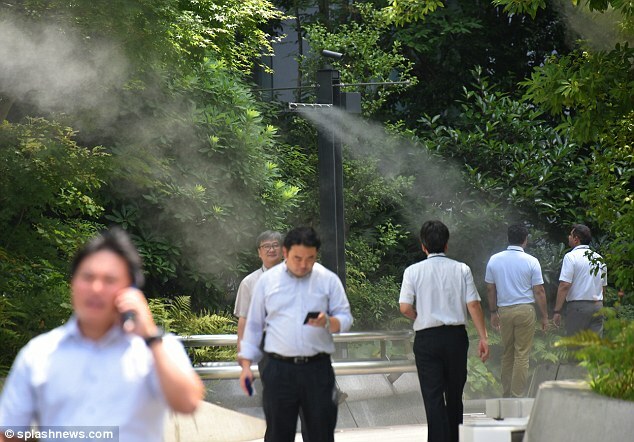 ‘As a record heatwave continues to blanket the country, urgent measures are required to protect the lives of schoolchildren,’ top government spokesman Yoshihide Suga told reporters today. The government said it would supply funds to ensure all schools are equipped with air conditioners by next summer. The pain was so bad that I lost consciousness. He lost consciousness on the way to the hospital, and regained consciousness the next day. He lost consciousness after his accident and never recovered/regained it. Less than half of Japan’s public schools have air conditioning, and the figure is only slightly higher at public kindergartens. Suga said the government would also consider extending this year’s summer school holidays as the heatwave drags on. 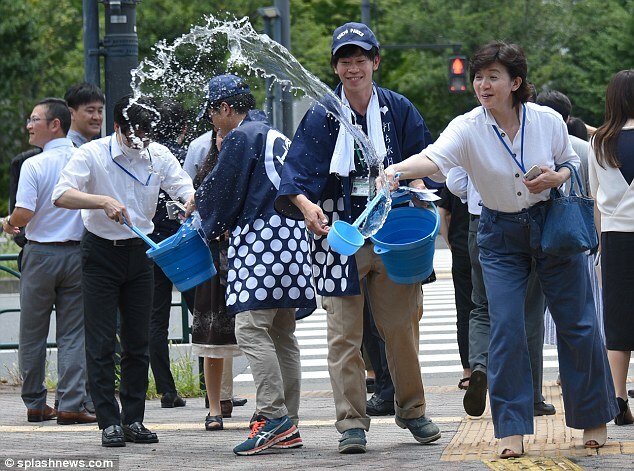 Temperatures reaching over 104F (40C) were registered for the first time in Tokyo’s metro area on Monday, where the government is promoting Uchimizu, a tradition where water is sprinkled onto the ground, as part of a summer heat awareness campaign. Some cases drag on for years. Sprinkle a few herbs on the pizza. Sprinkle the pizza with a few herbs. I sprinkled some sugar on top of the cake. She’d sprinkled coloured sugar strands all over the cakes. I like to sprinkle a little cheese over my pasta. Sprinkle cheese on the pizza. Sprinkle the chicken with soy sauce. It was marginally cooler on Tuesday, but temperatures remained well above normal in most of the country, and little relief is forecast. The agency warned that much of the country will continue baking in temperatures of 95F (35C) or higher until early August. Officials have urged people to use air conditioning, drink sufficient water and rest often. Results are only marginally better this year. It’s baking in here! Can I open a window? 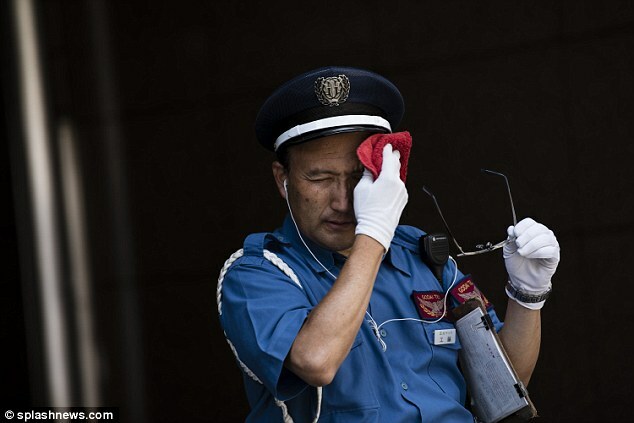 Japan’s summers are notoriously hot and humid, and hundreds of people die each year from heatstroke, particularly the elderly in the country’s ageing society. The heatwave follows record rainfall that devastated parts of western and central Japan with floods and landslides that killed over 220 people. And many people in the affected areas are still living in damaged homes or shelters and working outdoors on repairs, putting them at great risk. The record-breaking weather has revived concerns about the Tokyo 2020 Olympics, which will be held in two years time in July and August. Tokyo governor Yuriko Koike this week promised that the heat would be given the same priority as measures to counter terrorism. A record crowd of 120,000 people saw the game. I made it back to the office in record time. The long hot summer has led to a record harvest this year. We finished the work in record time (= faster than had ever been done before). Farmers in the Midwest are reporting a record harvest this year. After the government bombed their camp, the rebels countered with an attack on the capital. Extra police have been moved into the area to counter the risk of violence. ‘It’s just as important because the purpose is also to protect people’s lives,’ she told reporters, comparing Japan’s summer to ‘living in a sauna’. 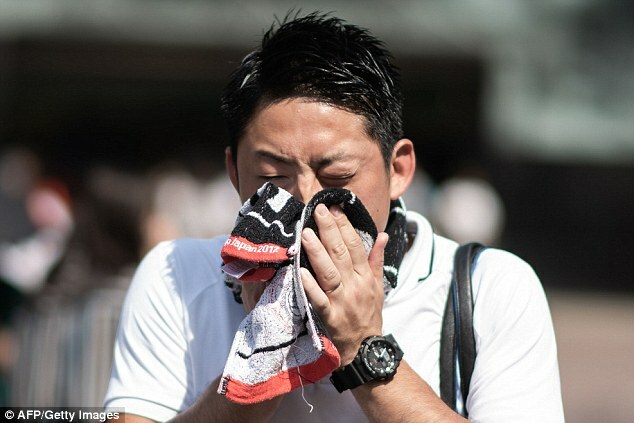 Japan recorded its highest temperature ever on Monday as a deadly heatwave continued to grip a wide swath of the country and nearby South and North Korea. About 10 people have died in South Korea as a result of the heat. The mercury hit 106F (41.1C) in Kumagaya, a city in Saitama prefecture about 65 kilometers (40 miles) northwest of Tokyo, the Japan Meteorological Agency said. That broke the previous record of 105.8F (41C) in Ekawasaki on the island of Shikoku on August 12, 2013. Two lingering high pressure systems have trapped warm and humid air above the region, bringing record high temperatures for nearly two weeks. Although the worst of the heatwave is expected to conclude this week, authorities have urged people to stay inside and use air conditioning. Other steps include developing road pavements which emit less surface heat, setting up mist sprays and planting tall roadside trees. She has lingering doubts about his ability to do the job. She faces a slow lingering death if the cancer isn’t treated now. Many students lingered after class. I like to linger over breakfast and read the newspapers. The smell of fish lingered in the kitchen. Doubts still linger about his honesty. His face lingered in her memory. Carbon dioxide causes the Earth’s atmosphere to trap heat. A greenhouse stays warm because the glass traps the heat of the sun. The machine emits a high-pitched sound when you press the button. Ms Koike also cited traditional ways of cooling in Japan, such as hanging straw screens and spraying water on road surfaces. The 10 people who died in South Korea succumbed to heatstroke and other heat-related causes, seven of them last week, the Korea Centres for Disease Control and Prevention said. About 1,040 people have fallen ill because of hot weather from May 20 to July 21, an increase of 61 per cent over the same period last year, it added. South Korea’s highest-ever morning low was recorded in the city of Gangneung, where the temperature was 87.8F (31C) at 6.45am on Monday. The morning low in Seoul was 84.6F (29.2C), a record for the country’s capital, according to South Korea’s weather agency. The mercury hit 103.8F (39.9C) in the south-eastern town of Hayang, the highest temperature in the country so far this year. In North Korea, residents fanned themselves on crowded trolleys or protected themselves from the sun with parasols as temperatures in Pyongyang, the capital, reached 93.2F (34C). Weather reports said even higher temperatures were recorded on the country’s eastern coast. He remembered the pain of watching his mother succumb to cancer. Thousands of cows have succumbed to the disease in the past few months.